The Leavenworth Times first received word of Allies and Central Powers signing the Armistice at 4am, November 11, 1918. Then all of a sudden a bedlam of whistles, bells and shots ruined all thought of sleep in Leavenworth and the wildest celebration in the city ever has known was underway. Armistice Day was first commemorated in the United States by President Woodrow Wilson in 1919, and many states made it a legal holiday. 11 Nov 1919 - On Tuesday, November 11, 1919, the headlines in the Times read – “Business Will Be Suspended In City Today, All To Join In The Welcome Home Celebration”, and that was the start of the nation’s oldest Veterans Day observance, the Leavenworth County Veterans Day Parade. 11 Nov 1926 - Congress passed a resolution in 1926 inviting all Americans to observe the day. 11 Nov 1926 – The parade was brief in Leavenworth due to President Coolidge being in Kansas City to dedicate the Liberty Memorial. The American Legion Byron H. Mehl Post 23 and the Leavenworth High School ROTC were only line of parade participants at 9:15am that morning. All offices at Fort Leavenworth, city and county offices, banks, and schools were closed; department stores remained opened. - 3pm football game: Abeles Field, Leavenworth High School and Benton High School (St. Joe, Mo), Leavenworth High School ROTC stage a battalion parade during halftime. 11 Nov 1933 – The Armistice Day observance consisted of two parades: The morning parade (11am) included military units, scouts, bands, 4-H, colored bands and colored veterans. The afternoon parade (3pm) included bands bicycles, floats, business vehicles, doll buggy entrants (contest). The day included a ‘Parking Ban’ on Delaware until 4pm.American Legion Post 23 gave its annual dance. 11 Nov 1937 – The Armistice Parade was only 30 minutes but the crowed was estimated at 6,000. Congress made Veterans Day a legal holiday nationwide in 1938. The holiday has been observed annually on November 11 since that date - first as Armistice Day, later as Veterans Day - except for a brief period when it was celebrated on the fourth Monday of October. 11 Nov 1938 – The Armistice Day Parade was the largest to date – estimated crowd was 10,000. This parade had the largest amount of military ever seen. 11 Nov 1942 – The country was now again at war and the city did not declare this day a holiday, but schools were dismissed for the start of Armistice Day services that began at 9:15am. LTC Raymond Orr conducted the morning observance at Leavenworth High School. The parade followed at 10:35am with the Grand Marshal being MAJ James Elliott, PAO, Fort Leavenworth. The downtown stores closed from 10:30am-11:30am. 11 Nov 1946 – The Leavenworth Times read, “12,000 Flock to Downtown District for Victory Parade.” Leavenworth has biggest crowd since 1919 – Fort Leavenworth is Generous. Drugstores and eating places jammed and distinguished guest view parade from stand on City Hall lawn. This day was set aside as an official observance of Armistice Day, V-E Day, and V-J Day. The highlight of the day was the parade with bands, army equipment – both modern and of that yesteryear, ROTC cadets, school children, Boy and Girl Scouts, floats, men and women on horseback, cars of distinguished visitors, and displays from Wadsworth. On the reviewing stand was LTG Leonard T. Gerow, commanding officer of Fort Leavenworth and his staff, Leavenworth Federal Prison Warden Walter A. Hunter and Lansing State Prison Warden Kudspeth, Leavenworth Mayor Kirmayer, city and county commissioners. The Victory Day parade celebration was coordinated by parade chairman Howard Faulkner who was a veteran of WWI. Taps was played at 11am followed by silence and the National Anthem. There were many Leavenworth vehicles and displays, several bands which included Washington Rural High School, Basehor High School, and Epiphany School; Leavenworth downtown merchants and civic organizations. Following the parade there was a band concert of all bands on Delaware. All visiting musicians were invited to a luncheon. Many Leavenworth merchants made substantial contributions to pay the luncheon bill. The troops and horses of Fort Leavenworth of years past were noticeably absent, but the AAF equipment, museum pieces and World War II vehicles made up for the troops. Many country schools turned out to participate. The American Legion held an open house that ran for two days as well as the Knights of Columbus and Veterans of Foreign Wars. Delaware street was still a very busy place by mid-afternoon. Some merchants reported that this was their biggest business since the 1945 Christmas season. Drugstores and eating places were jammed all day. 11 Nov 1950 – There was no parade as American Legion Post 23 stated they had difficulty getting military units to participate in parade. This Armistice Day observance was quiet with speeches given and music played on lawn of City Hall. 11 Nov 1953 – The same type of Armistice Day observance in Leavenworth as 1952. In Emporia, Kansas, on November 11, 1953, instead of an Armistice Day program, there was a Veterans' Day observance. Ed Rees, of Emporia, was so impressed that he introduced a bill into the House to change the name to Veterans' Day. After this passed, Mr. Rees wrote to all state governors and asked for their approval and cooperation in observing the changed holiday. The name was changed to Veterans' Day by Act of Congress on May 24, 1954. In October of that year, President Eisenhower called on all citizens to observe the day by remembering the sacrifices of all those who fought so gallantly, and through rededication to the task of promoting an enduring peace. The President referred to the change of name to Veterans' Day in honor of the servicemen of all America's wars. 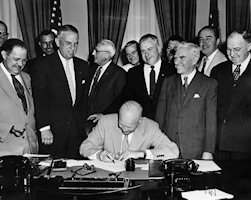 President Eisenhower signs HR7786, officially changing Armistice Day to Veterans Day. 11 Nov 1954 – As of this date, the observance/parade is now called Veterans Day and no longer Armistice Day. After parade, the American Legion Post 23 laid wreath at “Doughboy” statue at court house. Speeches were done at this location and Hay Market Square. Open houses were in many locations throughout the day. 11 Nov 1963 – With there being no parade for the past three years, veteran service and fraternal organizations came together to form a permanent committee to insure that the parade would continue. The parade was large, the first float contest was started with winners being St. Mary’s College, 1st place; Job’s Daughters, Bethel Chapter, 2nd place; and Cub Scout Troop 3167, 3rd place. IMAC High School was given honorable mention. The guest speaker for the afternoon was Representative William H. Avery (R). 11 Nov 1969 – Patriotism was evident Leavenworth as young and old viewed parade; with a crowd being estimated at 7,500. Parade chairman was James Simpson, American Legion Post 94. Taking part in the parade along with adults and young adults were representatives of the younger set – cub and brownie scouts and small fry horseback riders in the mounted units. Also participating were state, county & city officials, as well as Fort Leavenworth personnel. After parade, Eliaz Rodriguez post commander of American Legion Post 23 planted the “Freedom Memorial Tree”, a 30ft blue spruce, on the grounds of the Federal Post Office, 4th and Shawnee Streets. At the end of the tree planting ceremony, the Veterans of Foreign Wars Post 56, presented awards to 4 law enforcement officers. 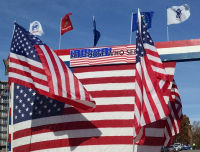 More than 7,500 spectators attended parade and other Veterans Day observances. 22 Oct 1973 - It has become a tradition now for SGT Arden Ryhne to take his traditional lead in annual parade. This was his 34th parade lead. All city, county, and federal government offices closed for the observance, as well as schools. Kansas Governor and Mrs. Robert Docking also led parade. There were band, floats, scouts, civic organizations, and service organizations participating. Most of the downtown stores and those at the Leavenworth Plaza remained opened. 24 Oct 1976 – Parade began at 10am with civic and service organizations; bands from area schools, both high school and junior high; city, county, and state officials; and Fort Leavenworth officials. After parade, the Veterans Administration Center and Fort Leavenworth National Cemetery held an observance with two ceremonies. The observance at the VA included the unveiling of the Medal of Honor grave marker for LT Daniel Dorsey and the Veterans Day Medal of Honor Tree Dedication. Fort Leavenworth observance also included the unveiling of a memorial plaque for Medal of Honor holders. Message was delivered by BG Louis Mertetrey. A special honor guard salute was provided by a special firing squad detail, US Disciplinary Barracks, Fort Leavenworth. Medal of Honor holders were MAJ Jack H. Jacobs and Herbert H. Burr. 24 Oct 1977 – The only mention of the annual Veterans Day Parade in the Times was a picture of the LHS Drum & Bugle Corp marching in front of Rexall Drugstore. It soon became apparent, however, that November 11 was a date of historic significance to many Americans. Therefore, in 1978 Congress returned the observance to its traditional date – 11 Nov. Kansas has elected to start its Veterans Day observance on November 11, 1977. 11 Nov 1978 – This marked the 1st observance of Veterans Day back on its original date. There were 2 parades in Leavenworth today: the first one started at 10:30am from Haymarket Square and ended at the reviewing stand at 1st National Bank; 2nd parade took place at the VA at 1:30pm starting at Lake Jeannette and ending at the Theater. All service organizations marched with their colors; BG Brophy delivered the main address after the parade. At 2pm, military and service organizations recognized the achievements of Gen Henry Leavenworth by placing a wreath at his grave. 11 Nov 1984 – The early morning snowfall may have deterred many from attending the annual Veterans Day Parade but the cold wind did not stop the Vietnam Veterans Chapter 75 from participating in downtown Leavenworth on Saturday. Over 100 units participated including marching bands from area schools, floats and cars. 11 Nov 1986 – Large crowds turned out despite cold temperatures to witness the annual Veterans Day Parade in downtown Leavenworth. About 120 units participated including Lansing HS band. Parade grand marshal was BG Alonzo Dougherty who accompanied by his wife Ellen. Earlier in the week Leavenworth Mayor Clarkson Brown gave proclamation to parade committee. 11 Nov 1990 – The theme of this year’s Veterans Day Parade was “Salute to Veterans through the Years.” With the weather being so great the parade had 150 entrants which included 1st Infantry Division Band, Fort Riley; Navy Color Guard, Olathe, KS; many military vehicles, area high school bands; homecoming queens; county and city officials from Leavenworth & Lansing; senior officers from Fort Leavenworth and liaisons to Fort Leavenworth from Turkey, Australia, Canada, Japan and Germany. 11 Nov 1998 - Grand Marshal was Carl Christian, youngest surviving member of the USS Arizona. Participation included Kansa Secretary of State Ron Thornburgh, WWI widow Genice McCormick, Citizen Pottawatomie Nation, Not only did the Fort Leavenworth military contingency was large but also support parade with military drivers. Parade committee got its first parade buttons which was a generous donation Daniel Banz. Flyover done by the 184th Bomber Wing, McConnell Air Force Base, Wichita, KS. Parade committee has started giving monetary wards for best patriotic float based on creativity, patriotism, and originality. Judges were selected from area businesses. 11 Nov 2000 – Veterans Day Parade honored the 50th anniversary of the Korean War, with the theme “Lest We Forget – All Gave Some, Some Gave All.” More than 200 invites went out. There were five Grand Marshals for this parade, all Korean War veterans: one each representing the Army, Navy, Air Force, Marines and Coast Guard. Flyover was done by the 184th Bomber Wing, McConnell Air Force Base, Wichita, KS. The 705th MP Color Guard lead parade, with participation from the Fort Leavenworth military contingency, the Command and Generals Staff College, Kansas National Guard, area JROTC units band and floats. 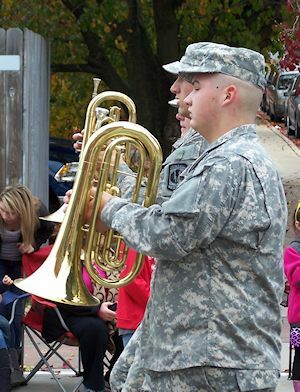 11 Nov 2006 – Parade theme “In Support of America”; parade honored with the two of Fort Riley’s finest – The Commanding General’s Mounted Color Guard and the First Infantry Division Band. 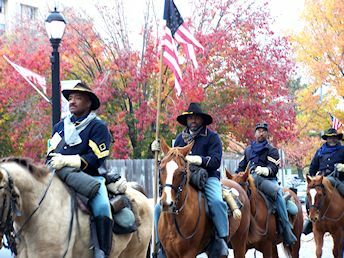 The 9th & 10th Cavalry Buffalo Soldiers were Grand Marshals; The Mounted Color Guard wore uniforms and equipment of the Civil War era. The Heritage Center sponsored a Veterans Coffee as well as the Leavenworth Rotary Club sponsored a Veterans Breakfast before the parade. All disabled veterans got their breakfast free. The Rotary club is making this breakfast an annual event leading up to start of parade. Immediately after taps a “swearing-in” ceremony of new recruits was done in front of the reviewing stand by the KC MEPS. LT Governor John Moore, BG John Daveron, were among the many dignitaries in the parade; a cannon provided by the Sons of Confederate Veterans sounded a reminder for taps; B Battery 1-161 Field Artillery brought the infamous howitzer; a first for the parade was ‘Sizzle’, that Kansas City T-Bones; baseball mascot and the Kansas Speedway PACE ca; there were many bands, floats, and WWII veterans. 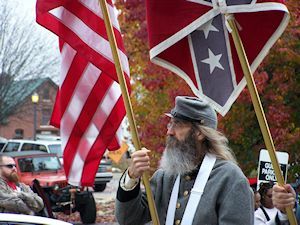 11 Nov 2011 – According to area media outlets & city police officials, the nation’s oldest regional Veterans Day observance was held in downtown Leavenworth, KS, on Friday, November 11, 10:30am, and was seen by 15,000+ spectators. The 92nd Veterans Day observance kept with the theme “America – Thanks to Veterans.” The parade committee selected James Rodgers as parade chairman and retired BG Stan Cherrie as grand marshal for the 2011 parade. The parade route ran from 4th & Cherokee Street east to Esplanade, north to Delaware, west to 7th Street, south to Cherokee, east on Cherokee to 5th Street where parade disbanded. The line of parade was led by bagpipers LTC Rob McWilliams, Dale Clelland, John Bauer & Kevin Regan and the 15th Military Police Brigade Color Guard, Fort Leavenworth, KS. The parade stopped at 11am for taps with a flyover by LTC Grant Gooch & LTC Mike McKee of the Iowa Air National Guard flying F-16s . More than 220 participants were invited to participate in this 92nd annual event. Participation included: MG John Daveron, Commander, 35th ID Division, KS National Guard; the military contingent of Fort Leavenworth; US Congresswoman Lynn Jenkins; US Congressman Jerry Moran; 9th & 10th Cavalry Buffalo Soldiers; Tuskegee Airmen; WWII veterans; Mayor Mark Priesinger, Leavenworth, Mayor Jason Ward, Tonganoxie; local & state politicians; boy and girl scouts; VISN 15 Heartland Director Mr. James R. Floyd; Judy McKee, Dir, VA Eastern Kansas Health Care System; A Viet Nam era helicopter; the Abdullah Shrine; area school bands to include Hickman Mills; numerous horse groups; JROTC units featuring the Kansas 931 Air Force JROTC, Washington High School, KCK, as well as our own LHS JROTC; police & fire agencies from around the state of Kansas & Missouri; numerous motorcycle groups and antique car groups; veteran service & fraternal organizations. A highlight of the parade was a special float in parade from MacNamara Moore American Legion Post 61, Ida Grove, IA, which was a reproduction of the historic flag raised on Feb. 23, 1945 at Mt Suribachi, Iwo Jima. The ‘Returning Hero’ float include Ardell Uhart, a WWII WAC, and winners of a free night at Union Park Guest House for the Veterans Day observance – retired Navy veteran Brandon Stark and his wife of Manhattan, KS, and SSG David Felpel and his wife of Herrington, KS. Special guests on reviewing stand included the oldest living WWII veteran in Leavenworth county Larry Land; various WWII veterans; the Wounded Warriors Transition Unit, Fort Riley, KS. Emcees for the parade were Mike Howell (4th & Cherokee), Bill Wallace (300 block Delaware) and Dan Wiley, (7th & Delaware). Balloons were distributed along parade route by area scouts prior to start of parade. Prior to start of parade patriotic music was performed by the Ric Jackson Trio at 7th & Delaware and 91 year old Navy veteran John Westphling performed in front of Riverfront Community Center. The Leavenworth Rotary Club sponsored its annual Veterans Breakfast 7-10am, morning of parade, at the Riverfront Community Center, all disabled veterans ate breakfast free. After parade, there were open houses at American Legion Post 23 & 94 and VFW Post 56. All were open to the public. Applebee’s Neighborhood Bar & Grill served free lunch & dinner for to all veterans. There was also a special Veterans Day exhibit featured at the Carroll Mansion, 1128 5th Ave, they also hosted a reception for local military personnel and veterans. Because of great weather, thousands turn out for Veterans Day parade on Friday 11 Nov. An estimated 15,000 people gathered in downtown Leavenworth to watch the 97th annual Leavenworth County Veterans Day Parade. The parade was led by bagpipers John Bauer, Kevin Regan and Dale Cleland. Theme for this year’s parade was “Honoring All Who Served”. With 175 entries in parade, an estimated additional 5,000 persons appeared in the parade. Grand Marshal was Vietnam veteran A.C. Byrd. LT Gen Michael Lundy commanding general of the Combined Arms Center and Fort Leavenworth, presented the Commander’s Award for Public Service to Byrd and retired Army Chaplain Gary “Sam” Sanford. Lundy also administered the oath to several entering the military. The parade had four emcees, 4th & Cherokee, Riverfront Community Center, 400 block of Delaware street and at the reviewing stand 7th & Delaware Street. In recognizing the 25th anniversary of the Gulf War, this parade spotlighted the contributions of Desert Storm veterans. The Leavenworth Rotary Club hosted their annual Veterans Breakfast where disabled veterans ate for free. The Heritage Center and ST. Martin Lutheran Church hosted a Veterans lunch with soup, chili, sandwiches and desert. Open houses were held at the American Legion Post 94, 3rd & Maple, the VFW Post 56, 519 Cherokee and Knights of Columbus 207 S. 4th Street. This year’s parade chairman was Ed Gunnels, Lansing American Legion Post 411. Emcees for the parade are Ron Coaxum, 4th & Cherokee; Tim Vandall, Riverfront Community Center; Bill Corbet, 400 block Delaware; Dan Wiley, Reviewing Stand, 7th & Delaware; and Walter McCullough, Jr., Haymarket Square. Leavenworth Rotary Club sponsors its annual Veterans Breakfast 7-10am, morning of parade, at the Riverfront Community Center, all disabled veterans ate breakfast free. After parade, there were open houses at American Legion Post 23 & 94 and VFW Post 56. All are open to the public. Applebee’s Neighborhood Bar & Grill serves free lunch & dinner for to all veterans (must show ID); Heritage Center serves luncheon to all veterans. Here in Leavenworth, veterans and active duty military are honored on Veterans Day with the year’s largest downtown parade. Annually, despite the weather, downtown historic Leavenworth, KS, is filled with a patriotic public paying tribute to veterans and their sacrifices. Leavenworth is selected annually as a regional site for the Veterans Day observance by the National Veterans Day Committee, Washington, DC. Leavenworth County Veterans Day Parade draws 12,000 to 15,000+ spectators annually. The Veterans Day Parade draws spectators not only from around Kansas but from Oklahoma, Nebraska, Missouri, Iowa, Colorado and Minnesota as well. The first Armistice Day was clear and perfect for a celebration. Every year since, the day has been fittingly observed here, in Leavenworth.